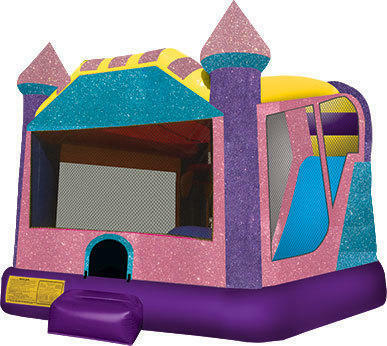 Setup Area: Length: 20'4" Width: 15'10" Height: 14'6"
This Dazzling Castle 4 in 1 Large Combo Bouncer brings an air of majesty and imagination to any event. Kids will rule in this brilliantly-colored castle with hues of Sparkling colors, perfect to suit any party theme, or to stand out during a busy event.! Each player can enjoy action on a wet or dry slide, or conduct their royal duties from the large interior jump. This bounce house combo offers up to four different activities for endless hours of activity. jumping area and a basketball hoop. It features an inflatable safety ramp at the entrance to protect excited kids as they scramble to get inside the bouncer. It also has large netted vent windows that keep things cool for the kids and allows parents to keep a watchful eye on all activities inside. Basketball not included, please select from our "Party Extras" to add to cart. Appox 6-8 users at a time.